My goodness, where did April go? Seriously. The month is almost over and I don’t feel like I’ve finished much of anything. In fact I haven’t even started my mystery blanket — the project for April — from the Knitter’s Almanac. Enough bellyaching and time to get back at it. Hopefully on Monday I’ll have some finished stuff to show you. In the meantime, you can enjoy the fruits of another Mama’s labor. She’s been outside my study window and on Thursday that little guy hatched. I think his little brother might join us today. As for where April went…well I’ve been asking myself the same question…I think having Easter half way through it…it has somehow skewed my perception of the month. hey! i was wondering where you’d gotten to– and was hoping everyone was healthy. my sister and i were talking about the same exact thing yesterday…where did april go?? i love the little birdies. a few years ago we had a robin’s nest on the corner of our deck. it was fun to watch the progress. 🙂 have a great weekend, jennifer! 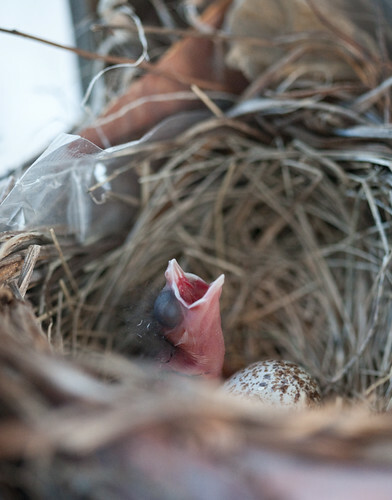 love the shot of your baby bird…really helps picture the new life all around us! How lucky that you get to see baby birds grow up! When I was little a bird made a nest outside my second story window for several years in a row and it was so cool to see the baby birds! that’s an awesome picture. Wow — that’s a gorgeous picture!! !